> Contact me for special requests. 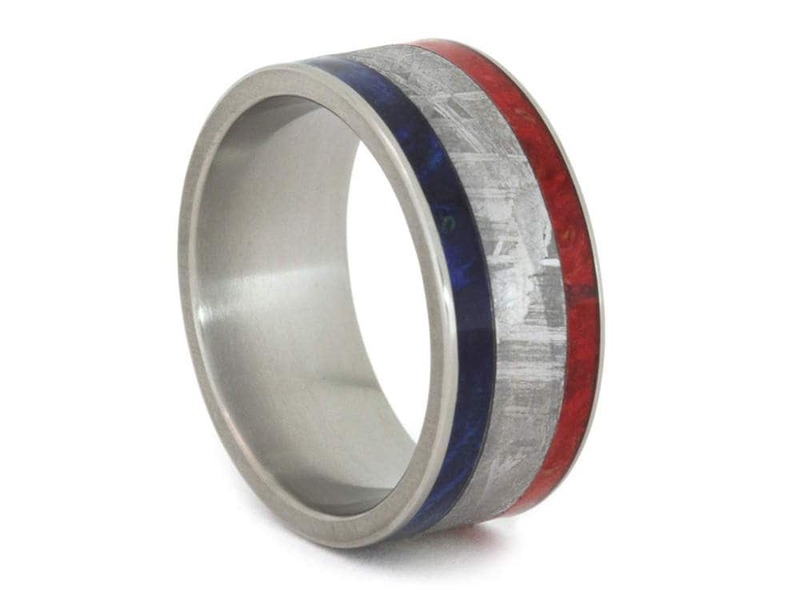 Please Note: All of our rings made with natural materials have their own unique colors and patterns. The materials used in your ring may appear different from the images in this listing. Earthy green plaid wrapping paper and a decorative bow make your gifting experience hassle-free! When I received this ring there was a huge scratch in it. After finally getting in touch with the designer he asked that I send him a picture. After receiving the picture I was told that's just the material of the stone. This is a noticeable scratch and very embarrassing to be used as a wedding ring with a huge scratch through the middle. I spent almost $1,000 on a wedding band that came in on time but two weeks prior to the wedding and I'm now out of options. Don't use this guy!! This is such a handsome ring. It looks even better than in the photos. My fiance is very pleased and can't wait to begin wearing it. This ring is beautifully made! Perfect ring for my soon to be husband. It’s beautiful quality and he can’t wait to wear it in September. This shop was very attentive and have great customer service. They really worked with me to customize the ring the way I wanted. Thank you! Precious Metal Rings: 5-6 Weeks. In Stock, Ready to Ship: 3-5 Business Days. Our products are designed and made one at a time, based on specifications provided by you. If you’re not completely satisfied with your item after you receive it, return it within the first ten days and you will receive in-store credit for us to remake, replace, or modify your returned jewelry in the same size as ordered. That credit will be used to repair or replace and ship said ring to satisfy our guarantee to you, the customer. The Guarantee is effective for one (1) year from the date you receive your ring, this date remains the effective date of the guarantee. If you take the ring to any other jeweler to get it resized or repaired in any way, the warranty is void. While we try to make your jewelry exactly to the specifications provided in the listing description; please keep in mind that these items are made painstakingly by hand and may deviate slightly from the specifications provided. When we make your ring, we create it according to the information you provide.If for any reason the information you provide is incorrect,there is a 20% remake fee, however if your item is crafted in a precious metal, contains a meteorite inlay, or contains a mokume inlay, the remake fee is 35%. Your original ring must be returned to us within 10 days to qualify for these remake fees. Refunds are issued as in-store credit. If there is any defects in your engraving that we are responsible for, it qualifies for our return policy. If you would like to purchase shipping insurance please view the link below and from the Shipping Upgrade Options during checkout please select your order value. The shipping insurance would cover the full cost of the ring in the event it is lost or stolen during transit." We want you to be fully informed about how to take care of your ring. Jewelry by Johan will provide cleaning and care instructions for meteorite rings in the packaging of your purchase. Rusting of meteorite cannot be covered under any guarantee as it is force majeure. If for any reason you wish to cancel your purchase you will get a full refund as long as it is within the first 3 days after the purchase. We reserve the right to cancel any sale if we feel that the buyer is unreasonable, 50% will be refunded if the ring is already in production and is still in our possession. All contents, custom designs, and jewelry are protected by U.S. and international copyright, © 2019 Jewelry by Johan. All rights reserved. Jewelry by Johan owns all designed content for customers and reserves the right to use this content for the benefit of the company. If an item is on sale, we will honor the sale price up to three days after the sale has ended. Discounts cannot be combined with other discounts. Our custom ring sizers are crafted in the exact width, size, profile, etc. of your desired item and allow for easy and accurate assessment of your size. If you purchased a custom ring sizer, and an item you receive is made in the wrong size, we will re-make the item for no cost (valid one time). Signature Styles can be exchanged for the correct size; simply contact us within ten days to arrange an exchange. If you do not purchase custom ring sizers and you receive an incorrectly sized item, there is a 20% remake fee. If your item is crafted in a precious metal, contains a meteorite inlay, or contains a mokume inlay, the remake fee is 35%.